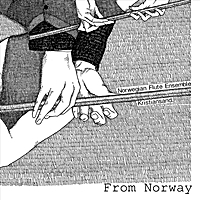 I've recorded two albums with The Norwegian Flute Ensemble, DNFE. The seccond one is still in post production, but should be out in good time for Christmas 2016. Wich would be supernice, because it is a christmas reccord! How do you record a flute choir? somewhere between 10-20 flautists playing in wonderful harmony? I don't think I've found the best way yet. But that's why I love this job. You do your best at the time and then you have a lot of time to analyze and make it even better! And then, hopefully, you get to try it again. And make something even better!